“It’s been a long road,” Etheridge said. “I know everybody is as anxious as I am. Personally, I’m not getting my hopes up, because it would hurt too much to have them dashed, especially by a doctor with such a swaggerific name as Dr. Swaid N. Swaid. But I’ll take the positive signs, sure will. Jay Tate’s also got a post up about Etheridge; he’s also confident Etheridge will be cleared but wonders if he’ll be the same player. I’ll wait to cross Bridge A before worrying about Bridge B, myself. 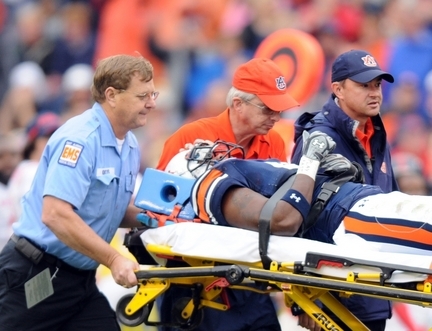 — Speaking of health problems and hopefully inspiring comebacks, it sounds like Shon Coleman’s recovery is continuing with all due haste. News that goes beyond “great,” obviously. — Gymnastics head coach Jeff Thompson has left Auburn for the same position at Penn State. I’m assuming PSU can offer greater gymnastics history and cachet and all that–Auburn didn’t have a whole lot, and what they did have, Thompson was largely responsible for–and certainly the competition won’t be quite as fierce in the Big Ten. Here’s to wishing Thompson the best of luck. But would it have killed him to say something nice about his tenure at Auburn on his way out the door? You were here 11 years, man. — The Senator takes a look at Football Outsiders’ field-position rankings and finds out that, whaddya know, Auburn was fourth from bottom in the SEC last year. This will not be a surprise to anyone who hasn’t had their memories of our kickoff coverage and punt return units wiped Eternal Sunshine-style, though if you did, I don’t blame you. — At first I wondered, you know, I know he’s Bobby Johnson and the sort of coach I’d like any hypothetical sons to play for, but July? Really? Even if you’re a burnt-out husk of a coach by this time, how do you reach that conclusion after what’s basically the cushiest two months out of a college football coach’s entire year? Shouldn’t his batteries be recharged? And then I realized, Johnson’s probably wondering the same thing. If he got to mid-July and still felt at the end of his rope, it really was probably time to let go. Best of luck to him. I’m not sure anyone in the SEC did a better job in the past eight years than he did. Seriously. Next for Vandy: they’ve got to go to the option after Caldwell limps through this season. Got to. Everything else has been tried. None of it’s worked. Not sure if you find a guy from Johnson’s staff, Niumatololo’s, Calhoun’s, Ellerson’s at Army, the head coach doin’ the option thing at Georgia Southern … but you gotta get one from somewhere. Should we start a fund to call it TWER Arena? I’ve got 10 bucks. But Fiu’s so darn pithy! I’d pay good money to have the 2008 season wiped from my memory. Vandy going to the option would be mega-awesome. Let us hope that Dr. Swaid M. Swaid bears his news like he bears his daughters. Those who remember Tiger and WarEagle http://www.thewareaglereader.com/2009/11/the-legend-of-wareagle-and-tiger/ will also recall Mandy Swaid, she of the 8th grade hallway, she of the Milo’s ad, one of the most beautiful girls ever. Do they still have her picture up? Wait, Milo’s closed. Point is, I think Zac has been in good, good hands. Looking forward to it. IVandy should hire Mike Leach. No major program wants to touch the guy right now, but what does Vanderbilt have to lose? In terms of actual football intelligence and coaching ability, Leach is drastically undervalued right now…. opening a rare window for a team like Vandy to land a top college head coach. And he is just quirky enough to make it work, methinks. If it does work, the entire SEC East landscape is shifted, Vanderbilt is suddenly relevant and the dread pirate is back in business. If it doesn’t… oh well, go back to being Vandy. iVandy, coming soon from Apple…. My b.
I’ll put $10 in the pot – only if the scoreboard is renamed “The Joe Cribbs CarWash Scoreboard”. Haha, that would be perfect. I always liked the “Joe Cribbs Car Wash” name. It had a certain uniqueness to it. And I’m all for Vandy going to the option; they need to get Navy’s coach, Niumatololo! Motion carried iVandy Commador64 will commence with a combination of Ulimate SpreadX and retro Wishbone Option Running attack in their sick thin lined stadium. Grad students will download the apps and start practice. I doubt Coach Ken will leave Navy for Vandy. He’s got too sweet a deal up there winning games where they love him. He’d have a big challenge at a school with no real history of winning. PJ’s move to Tech was different, because Tech had always been decent and had potential in a conference weaker than the SEC. Now Ivin Jasper (Navy’s OC) might be possible. But just stay the hell away from Jeff Monken!!! I’ve been suffering Triple Option withdrawals since GSU’s abomination of an AD got rid of our coaches who ran it and turned GSU from an every-year playoff/championship contender into a has-been horrible team. We’re all hoping that Coach Monken (who has coached with PJ for YEARS) will return us to our roots. I guess I should explain that last comment for those who may not be aware… I’m finishing my Master’s Degree at Georgia Southern right now, and my father went to school there, so I grew up on the Triple Option at the school where PJ invented it in the mid-1980s and then perfected it in the late 1990s. bellhead, that comment is a classic. I’ll be all for renaming the scoreboard the JCCW Scoreboard if the real JC will sign off on it. When, you know, I win the trillion-dollar international lottery and we get this naming thing done.